Maumee, Ohio, Jan. 8, 2014 – Spicer® high-performance chromoly axle shafts – optimized for use with larger tires – have been introduced by Dana Holding Corporation (NYSE: DAN). The new Spicer® chromoly axle shafts are manufactured using SAE-4340 nickel chromoly steel for maximum strength and durability and are heat treated to ensure optimal hardness throughout. The Spicer® axle shafts are made entirely from SAE-4340 nickel chromoly steel for ideal hardness throughout the structure. The nickel provides additional toughness, while the chromium ensures high-temperature strength and resistance to abrasion. Dana also adds molybdenum to maintain a specified hardenability. Heat treatment processes developed for the Spicer® chromolyaxle shafts are designed to increase core hardness to precise levels, while at the same time optimizing case and surface hardness, to achieve maximum impact strength and durability. 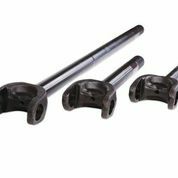 More information on the Spicer nickel chromoly axle shafts is available at www.DanaUnleashed.com, or by calling Dana Customer Service at 1-800-621-8084. Powered by recognized brands such as Dana®, Spicer®, Victor Reinz®, Glaser®, GWB®, Thompson®, Tru-Cool®, SVL®, and Transejes™, Dana delivers a broad range of aftermarket solutions – including genuine, all makes, and value lines – servicing passenger, commercial, and off-highway vehicles across the globe. Leveraged by a global network of 13 distribution centers, Dana’s dedicated aftermarket team provides technical service, customer support, high fill rates, and on-time delivery to customers around the globe. For more information, please visit www.dana.com/aftermarket. Dana is a global leader in the supply of highly engineered driveline, sealing, and thermal-management technologies that improve the efficiency and performance of vehicles with both conventional and alternative-energy powertrains. Serving three primary markets – passenger vehicle, commercial truck, and off-highway equipment – Dana provides the world’s original-equipment manufacturers and the aftermarket with local product and service support through a network of nearly 100 engineering, manufacturing, and distribution facilities. Founded in 1904 and based in Maumee, Ohio, the company employs 23,000 people in 26 countries on six continents. In 2013, Dana generated sales of $6.8 billion. Forbes magazine selected Dana as one of America’s 100 Most Trustworthy Companies in 2014. For more information, please visitdana.com.